Probably everyone's first experience with Greek wine is with its ubiquitous Retsina. My personal introduction to Greek wine was in a small taverna in Northern Greece in the town of Saloníki. This was in the early evening in a big city where the driver of our bus decided it was close enough to our destination of Athens and he was going home to Istanbul. Making the best of our stranded tourist situation, another traveler and I joined up and found a small taverna in the city's square. There, we spent the evening eating Greek mezedes and drinking Retsina, a pine-scented wine that has more in common with a disinfectant cleaner than a Chardonnay. My traveling companion and I drank two bottles of the pine resin wine that evening while figuring out our next step towards Athens the next day. It took some patience to embrace the Retsina but by the end of the first bottle we were happy to be off our bus and the wine was pouring freely. I was in Greece a couple of weeks after that and there were several more bottles of Retsina. When I finally left, I felt like my entire digestive system had been shellacked. Homer, Aristotle, Plato, Aesop, Melina Mercouri, Zorba-great Greeks all. However, Dionysos is the one who put the spirit into Greek wine. There's nothing like a mythological god to help promote wine. Gods might drink nectar but humans had wine and humans got the better end of the deal. 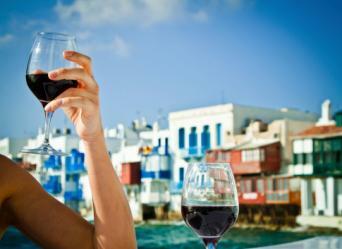 Actually, wine was known all around the Mediterranean since ancient times. In Greece, evidence of winemaking and consumption has been found on the Greek island of Crete dating as far back as 2500 B.C. with the origins probably coming from Egypt. Regardless, wine was an important beverage in ancient Greece, not only for indigenous consumption but for trade. Greek amphorae, those odd-shaped terra cotta jars with two handles on the top and a pinpoint base that would topple over without support are used for storing wine and have been found throughout the Mediterranean geography. Occasionally, maritime archaeologists will even pull up an amphora from an ancient shipwreck with a few sips of well-aged wine left. And by the way, pine resin was used to seal the porous jugs. Coincidence? There's more to Greek wine than the Pine-Wine. Greece has a sophisticated wine industry with Greek laws implemented under the Ministry of Agriculture and follow the European Union's regulations that are patterned after France's AOC laws. The majority of grapes grown and used to make wine are ancient varietals with white grapes dominating. Retsina anyone? Curiously, some of the best Greek wines are red. There's also been an infusion of non-native grapes such as Cabernet Sauvignon and Chardonnay with many winemakers blending these indigenous varietals for some unique variations. An example is a red wine, Amethystos that is a blend of Cabernet Sauvignon, Merlot, and the Greek Limnio grape. The complex wine shows many of the usual Cab blend characteristics but the Limnio gives it a dramatic boost of earth, spice, herbs, and extracted fruit. Wineries are found all over the rocky ancient land with many small family run operations as well as larger wineries. The industry is also starting to catch up in using modern scientific practices together with the old traditional ways. And while wine is made everywhere, the following represents the best quality regions. These are divided into seven wine regions with their corresponding sub-regions. Some are on the mainland and some are scattered on islands. There are over 300 native grape varietals in Greece, some better than others. The following represents some of the most important ones with their associated wines. This is a major grape in the Aegean and particularly noteworthy from the island of Santorini. It makes a dry aromatic wine that is citric crisp with mineral tones from the island's volcanic soil. Assyrtikos is also blended with Mandelari grapes to produce a sweet wine called Visánto. This is an aromatic grape with pinkish skin that comes from Mantinia in the Peloponnese region. It is crisp and floral with spice and delicacy. This white Muscat produces a sweet and aromatic slightly fortified wine from Patras or from the island of Samos. Not that it makes a great white wine but Savatianó is the most prevalently planted varietals. It is common to find with the wine's quality and character all over the map. At best it is a blank slate to work with. However, when made well it produces grassy and peachy wines. 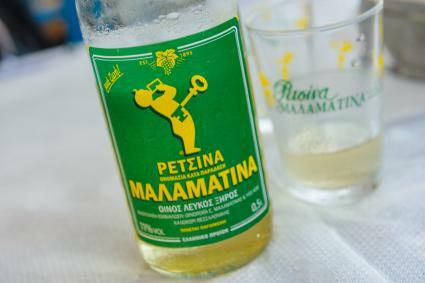 Are you surprised that most Retsina is made from Savatianó? Probably the most important red, Agiorghitiko is prominent in Nemea wines from the Peloponnese. Soft in tannins but with deep aromas and complexity that produces supple wines with spice and cherry flavors. Nemea wines are reliable picks. An ancient grape from the island of Lemnos. It makes a robust red with acidity. This is a red that is common on Crete and Rhodes and makes distinctive and flavorful wines, although on the tannic side. This grape is found in the Peloponnese and Ionian Islands. The black-skinned grape makes a sweet fortified wine from Patras called, Mavrodaphne. Best known as the major grape in Macedonia's Goumenissa. Xynovaro produces a rich and flavorful red with complexity and earthiness. It's the type of wine Alexander would have drunk.